The patron Saint of the island, Saint Gerasimos, has been the source of solace and strength for locals and for pilgrims that arrive to the island to receive his grace. 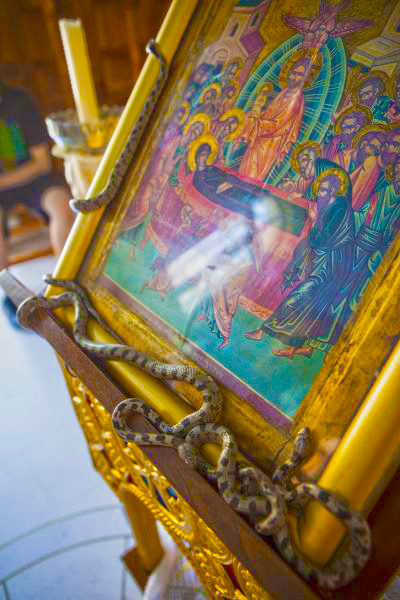 His holy relics are kept in a glass relic-case in the magnificent, highly ornate Saint Gerasimos chapel in Omala area. It is very common for the locals to name their children Gerasimos (Makis for short) in His honour. Saint Gerasimos is celebrated on two special feast days, 16th August – the anniversary of his death and 20th October which commemorates the day his bones were removed from his tomb. Apart from the patron Saint, the island features a bunch of humble monasteries, worth to visit not only for their religious significance but also for their beautiful setting, cultural heritage and unique phenomena. Let’s make a religious trip in Kefalonia. On the edge of a solid rocky cliff high above the sea in Palliki area, lays The Monastery of Kipouria. Built in 1759, is still a deeply spiritual site held by Father Efsevios, a modest, yet welcoming solitary monk. Worth to mention, the sunsets from the natural balcony in Kipouria are spectacular. 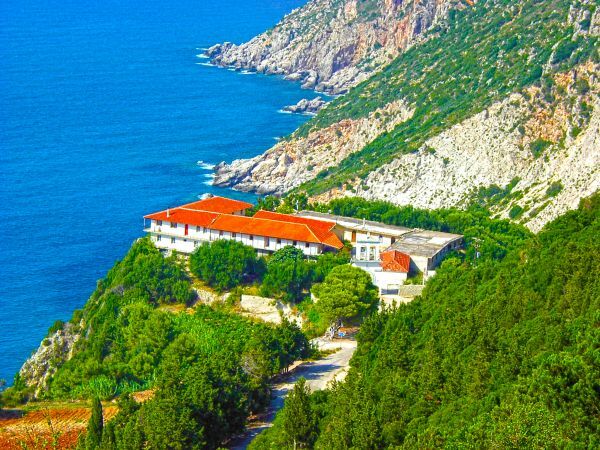 In a landscape of exquisite beauty above Poros Village, 760 m above the sea level, find yourselves in Kefalonia’s oldest monastery, the monastery of Atros. Its name derives from the Greek word “atrotos” which means invulnerable, due to its strategic position. It offers panoramic views to the surrounding islands and the Ionian Sea, initially for protection against the pirate raids during the early Christian years.